With the presidential election only a month away, many people in the vaping community have been wondering if any of the candidates have shown any support for vapers. Sure, it’s easy to say that more conservative candidates tend to be opposed to unethical government regulation (like the FDA vaping regs), and that more liberal candidates support regulation. But have any of the presidential candidates explicitly mentioned their support for vaping? None of the candidates had specifically mentioned support for vaping. Until last night. “In the first debate, voters listened to two candidates dance around the American economy. What you’ll never hear from those candidates is how the economy is being killed by excessive regulation. Vaping, a new industry offering products as a healthier alternative to smoking, is about to be regulated out of existence. That just doesn’t make any sense. Screenshot of the email from the Johnson campaign. 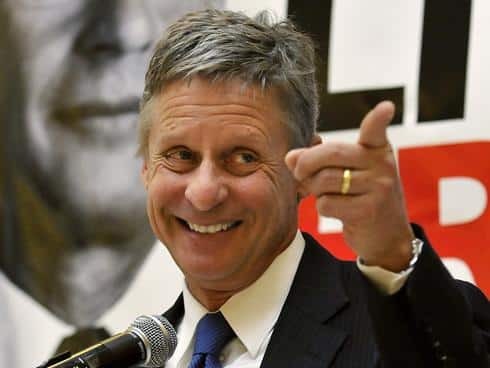 Of course, it’s no surprise that the Libertarian Party would be the first to openly support vaping, with their free-market and anti-regulation philosophy. Hopefully this inspires some of the other candidates, including Trump and Clinton, to make statements to let vapers know where they stand on this important (to us) issue. Read more about the Johnson/Weld campaign on their official website. Who are you voting for this presidential election?